Networking….that’s how business was promoted before the internet. The business owner or marketing executive met with people who in turn introduced them to other people. That’s how the “network” of people grew. But with the birth of the internet, and social platforms like Facebook, Twitter, Instagram etc. the “network” not only grew but also took on its own personality. So now, you don’t have to “meet” someone who knows someone who might need your services. Now, you can market your business directly to your prospective clients and create your own network. So, how would you become visible to the World? By Social Media Optimization. 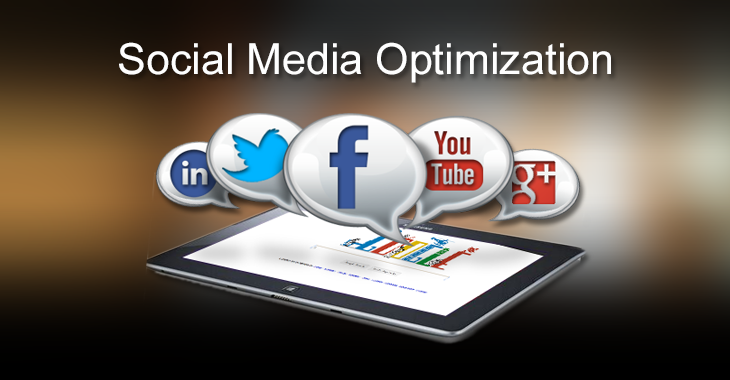 Social Media Optimization (SMO) and Search Engine Optimization (SEO) have a distinctive purpose. That being said, we know that search engines like Yahoo, Google, Bing etc allow people to find content that accommodate their needs and SEO is all about laying down some strategies into action to optimize the content so as to become visible on the search engine result page. But it should also be kept in mind that techniques of SEO writing are different from the methods needed to optimize contents in different social networking sites like Twitter, Facebook, LinkedIn, and YouTube.Social Media Optimization(SMO) is all about harnessing inbound marketing strategy to enhance the visibility of your content on the web. Social networking sites such as blogging sites, social bookmarking websites are being used by people to post fresh, relevant and engaging content on the web. So for many businesses, social networking platforms have become profitable ventures for getting connected with the potential customers and market their brands. If any business promotes its brand tactfully, it can create an endless untapped opportunity to serve through to promote its brand to their prospective customers. Whether it is Facebook marketing, micro-blogging through Twitter, video promotion via YouTube or displaying your projects through Pinterest, you can dominate the space with your branding. The delivery on social media can differ from status updates, videos, pictures, comments, blog posts, presentations and any type of activity which captures the power to begin with a conversation. For the success of an SMO campaign, optimizing the content and its appropriate distribution into different social networking sites requires utmost priority. The essence of an SMO program is to broadcast the word of mouth through the periodical content sharing and feeding it to the customers searching for an identical type of information. The SMO content can act as the focal point of online dialogues assuming the form of wall posts on Facebook, videos on YouTube, Pictures uploaded on Flickr, micro blogs on Twitter, blog comments or guest posts etc. While SEO attempts to augment the visibility of the websites in search engines, what SMO does it to hold the content and make it accessible to the user who are looking for similar type of information. Similar to the SEO content,SMO contents can also be contextualized by using headings, subheadings, tags, keywords and description. Social media presence is a must-to-do-thing which social media optimization companies in Michigan consider it to be a powerful medium to engage the web users and ignite an online dialogue to catch hold of the prospective buyer’s attention online. Hence, a persuasive social media marketing strategy is very well needed to derive the benefits from the social media platforms and improves the site’s visibility.